These two Fred Moore drawings were recently auctioned off at Heritage Auctions. In them you can actually study four different stages of Fred's drawing approach. In the upper sketch the orange lines were the first ones he put down. They are rough and spontaneous, and show how he begins to define staging and expressions for the characters. Note that the pig on the left was originally placed further to the side. Moore's black pencil pass on top is still rough and loose, but it clarifies the main volumes in greater detail. Practical Pig's index finger was changed for better silhouette. The drawing is most likely a publicity illustration, since all of the characters were drawn on the same sheet. 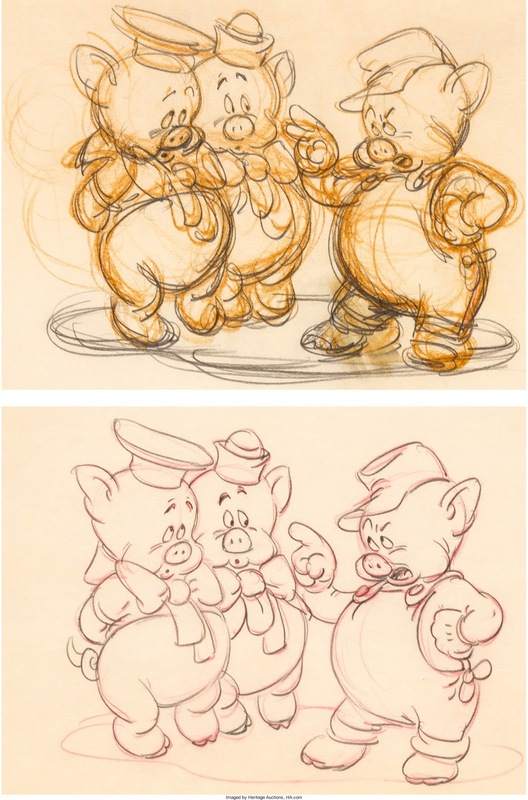 This would not happen in an animated scene, since due to the pigs' individual timing, they would be drawn on separate sheets. The liveliest version of the two is the upper one. Each time you reduce your instinctive scribbles down to thin fine lines, some of the drawing's life is lost. But...this is the classic Disney style, thin, distinctive outlines and flat color shapes.